1. In a bowl add your Rosemary, Thyme and Garlic and your Hamburger. Mix well. 4. 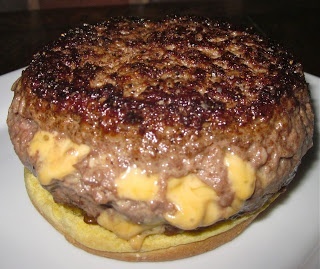 Once your burgers are formed, push down in the center of the patties making sure that there is a well in the center. Fill the center with a few pieces of Cheddar Cheese Curd. 5. Once they are filled pull the sides up and pinch it together and then roll them in to a ball slightly pressing them down. 6. Put in oven at 350 degrees. Or you can put them on the grill. Just make sure that you put till foil down on the racks to make sure the cheese does not come out.